September 24, 2016, 1:32 p.m.
Jeremy Corbyn has just been re-elected as leader of the Labour party, beating rival Owen Smith by 62% to 38% - exactly the figure given by YouGov in our survey of the Labour selectorate. YouGov also conducted the equivalent of an exit poll* of Labour members in the days between the ballots closing and the result being announced for Election Data. The results of the poll – 59% Corbyn, 41% Smith – also exactly matched the result among Labour members. Please note, this was a poll of members only – the results do not include those members of the Labour selectorate who were registered supporters or trade union affiliates. Jeremy Corbyn wins among 17 of 20 demographic categories we measured against. He performed best among more recent members, where he held a lead over Smith of 68 points among those who have become a member since he was first elected leader, and 49 points among those who became a member during the last leadership election. 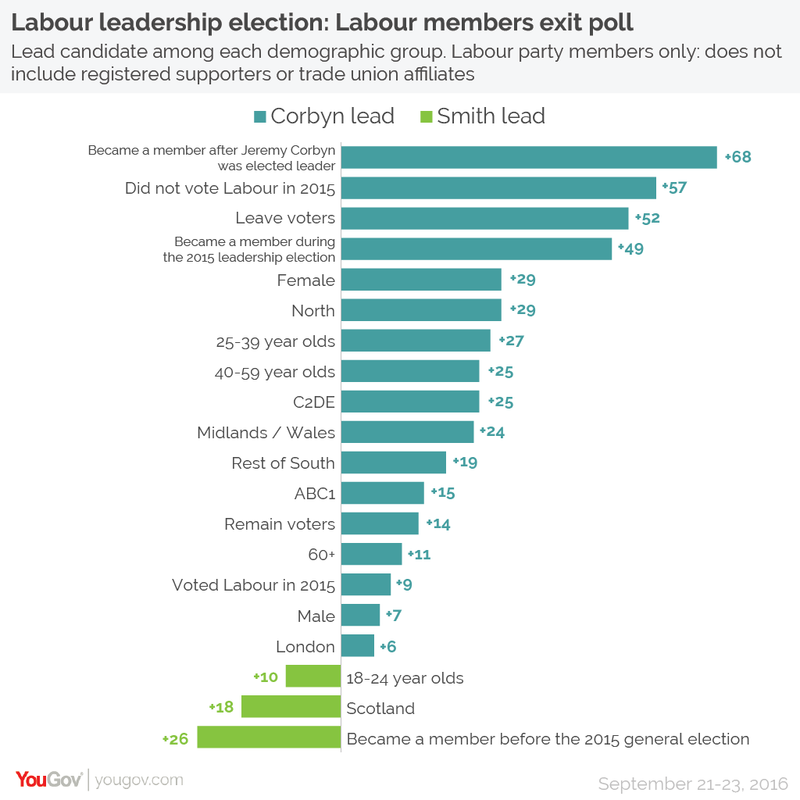 Corbyn also secured far more votes among those who did not vote Labour in 2015 (a lead of 57 points) and Leave voters (a lead of 52 points - hardly surprising given Smith’s second EU referendum pledge). Smith was strongest in three groups: 18-24 year old members (a lead of 10 points), Scots (18 points), and those who have been members since before the 2015 general election (26 points). However, it should be noted that the samples for 18-24 year old members and Scots are actually two of the smallest sample sizes in the survey and should be treated with caution. *a traditional exit poll, as happens at a general election, is not possible for elections where there are no physical polling stations.